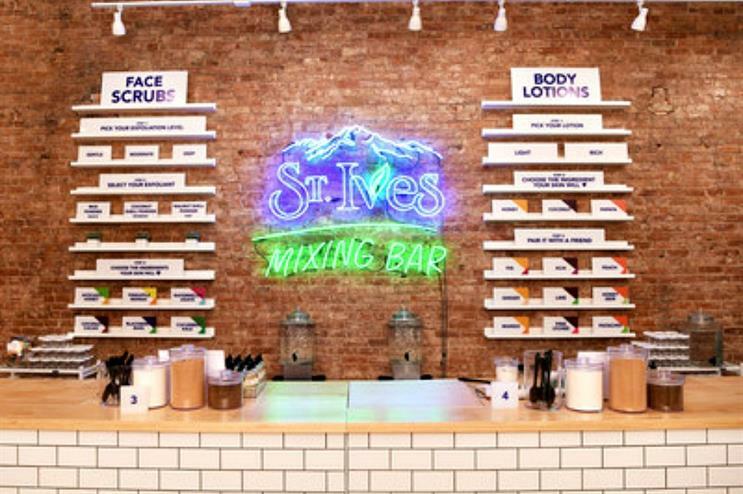 Beauty brand St Ives has opened a pop-up mixing bar in New York, inviting guests to immerse themselves in the brand's world. The 1800 square foot store is inspired by the St Ives' joyful brand message and image, and features a mixing bar where guests can choose from more than 50 unique ingredient combinations. They can also choose their desired level of body lotion richness and facial scrub exfoliation levels. Guests at the mixing bar also get to experience over 20 new skincare ingredients such as pink lychee, kale, ginger and volcanic sand. An educational ingredient wall is also in place at the pop-up, giving information on the brand's popular and natural ingredients, and sink stations invite visitors to sample existing and customised products. A mirrored infinity room filled with giant apricots offer guests the opportunity to take photos and post to their social media channels. The pop-up will be open until 30 July. More: Last month, Neutrogena opened its Beauty Box in east London, inviting guests to take part in a range on experiences. In April, Sephora opened tech-based beauty workshops in New York.